The new build H-048 is designed and developed in cooperation between ESVAGT and Havyard and is under construction at Cemre Shipyard in Turkey. ESVAGT’s unique concept has set the standard for efficient operations of far-shore wind farms for several years. ESVAGT will extend this position in the autumn when the new build H-048 starts operation at the 165 MW offshore Belwind 1 project in Bligh Bank, Belgium. 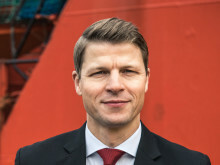 The vessel replaces the ’Esvagt Supporter’ after six years of good cooperation with MHI Vestas Offshore Wind on the offshore wind farm. At 58.5 metres, the new SOV is much larger than the ’Esvagt Supporter’, giving it more cargo room and space for 22 technicians in addition to the vessel’s crew. It is though somewhat smaller than the SOVs, the ’Esvagt Froude’ and the ’Esvagt Faraday’, that are in service on the offshore wind farms, the Baltic II and the Butendiek for Siemens Wind Power, and the ’Esvagt Njord’, that works on the Dudgeon Wind Farm for Statoil. “We are pleased to show how the SOV concept can perform tasks in several categories and that it can be adapted to suit the needs and wishes of our customers; from the number of technicians to cargo space, workshops, ROVs, helipads and much more. The newly built vessel is for instance the first SOV new build without a gangway system for transferring personnel. 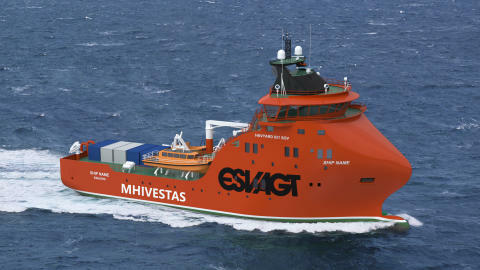 The design itself allows for a walk-to-work gangway but based on good experience with Safe Transfer Boat transfers from ‘Esvagt Supporter’, MHI Vestas could conclude that in this case, transferring technicians, equipment and spare parts would be more efficient using ESVAGT’s Safe Transfer Boats: One STB12 and two STB7”, says Søren Karas.